The UPA government has told the Supreme Court that it will frame a new policy for pricing essential drugs by end-November. Currently, only 74 drugs are under price control. The government now wants to bring all the 348 drugs under the National List of Essential Medicines (NLEM) under price control. However, there may be a difference in the manner in which the price is calculated . 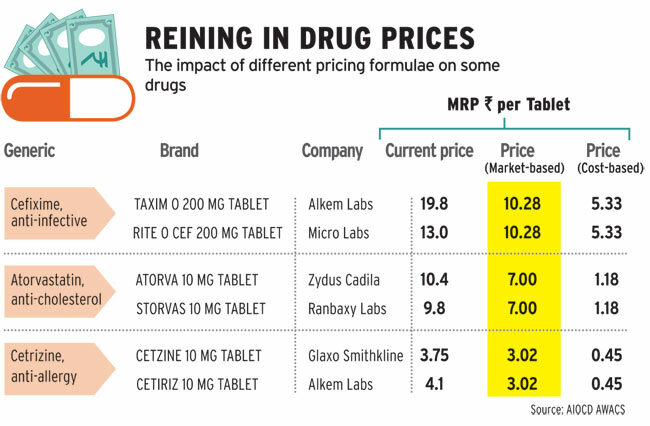 At present, the prices of the 74 drugs are determined using costbased pricing. The group of ministers which considered the issue has approved a marketbased pricing method for all the NLEM drugs. The NLEM is a publicly available list. The ministerial panel's recommendations have been criticised for excluding all combination drugs from price control. A pharma company could still sell NLEM drugs above prescribed rates by combining them with other chemical substances. In a market-based system the average cost of NLEM drugs will fall by around two per cent, says pharma market research company AIOCD AWACS, part-owned by a trade association of chemists and distributors. If the cost-plus method is extended to all 348 essential drugs the overall benefit to the consumer would be around 10 per cent. This is based on the average price in the market. Average price has been defined by the group of ministers as the weighted average price of brands which have more than one per cent market share in a segment. It is favoured by the industry but opposed by consumer bodies. The latter argue the policy will legitimise overpricing of drugs.